Defense Secretary Chuck Hagel defends controversial prisoner swap to Congress, claims ends justify the means in saving soldier's life. US Secretary of Defense Chuck Hagel staunchly defended the US's controversial prisoner swap with the Taliban on Wednesday, stating that the move was for the benefit of the US as well as freed captive Sergeant Bowe Bergdahl. "We complied with the law, and we did what we believed was in the best interests of our country, our military, and Sergeant Bergdahl," Hagel stated to Congress Wednesday. "The President has constitutional responsibilities and constitutional authorities to protect American citizens and members of our armed forces. That's what he did," he continued. "America does not leave its soldiers behind. We made the right decision, and we did it for the right reasons - to bring home one of our own people." The Bergdahl deal, announced earlier this month, saw five top Taliban terrorists released for the soldier, who has been held captive since 2009. Several elements of the deal have made the trade the subject of intense political and media scrutiny over the past several weeks: the failure to report the deal to Congress, which stands on shaky legal ground; the Taliban's hailing of the deal as a "tremendous victory" for terrorism in Afghanistan; and rumors that the soldier was not captured from his base, but deserted voluntarily - and even came to grow close to his captors, learning their language and teaching them badminton. Hagel conceded on Wednesday that the administration should have tried harder to let Congress know about what he called "rapidly moving developments," in the Bergdahl case, and claimed he understood "the frustration" from being kept in the dark. "I value the Defense Department's partnership with Congress and the trust we have developed over the years," Hagel said. "I know that trust has been broken." "We could have done a better job at keeping you informed," Hagel admitted, stating that the entire trade took a matter of several hours. Critics have said the administration violated the 2014 National Defense Authorization Act, which requires a 30-day warning before releasing terrorists from the compound. But Hagel continued to reiterate that the US was concerned with Bergdahl's health in weighing the trade, saying that the ends justified the means. "As the opportunity to obtain Sergeant Bergdahl's release became clearer, we grew increasingly concerned that any delay, or any leaks, could derail the deal and further endanger" him, Hagel said. "We were told by the Qataris that a leak, any leak, would end the negotiation for Bergdahl's release. We also knew that he would be extremely vulnerable during any movement, and our military personnel conducting the handoff would be exposed to a possible ambush or other deadly scenarios in very dangerous territory," he said. According to Hagel, the US requested a proof-of-life video in November 2013; the video, received in January, "showed a deterioration in [Bergdahl's] physical appearance and mental state." "Our entire intelligence community carefully analyzed every part of it and concluded that Sergeant Bergdahl's health was poor and possibly declining. 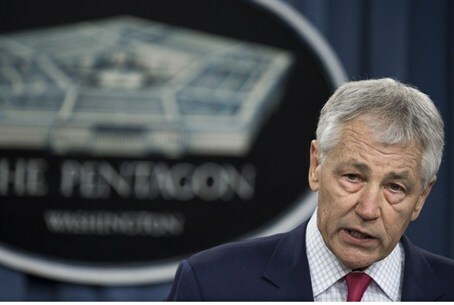 This gave us growing urgency to act," Hagel said. Hagel complained about the politicization of the Bergdahl exchange during the hearing, and said he was "offended and disappointed in how the Bergdahl family has been treated by some people" amid the controversy over the release. The Bergdahl family has been on the receiving end of several death threats since the trade was announced, in part due to the controversial actions of Bowe's father Bob Bergdahl. The elder Bergdahl had grown a beard and learned Arabic and Pashto during his son's captivity, and made a number of statements which critics say are suspiciously anti-government. The FBI has personally sent a security detail to protect the Bergdahl family in their native Idaho, after they received three death threats earlier this week. In the meantime, according to the Daily Mail, Bob Bergdahl has shaved his beard after growing backlash. Bowe Bergdahl, meanwhile, is "continuing to improve every day" at a military hospital in Germany, Pentagon spokesman Col. Steve Warren said this week. He has reportedly refused to speak to his family, including his parents and sister.